210mm x 135mm, 8-1/4" x 5-1/4"
Whether your next adventure will be in Afghanistan or Alabama, these two reference guides (Adventure Motorcycling Handbook, Overlanders' Handbook) are a great place to start. not just essential motorcycle adventure research, it's essential motorcycle adventure literature reading. There is simply no other resource with such a broad spectrum of traveling wisdom – mechanical, cultural, and anecdotal. if you only ever buy one book on adventure riding then make it this one. Fortunately, I had Chris Scott's indispensible 'Adventure Motorcycling Handbook' up my sleeve, which clearly outlines the unwritten rules. ...one of those essential volumes that belongs on every biker's bookshelf. If you're planning an overland adventure the AMH should be on your checklist right next to 'motorcycle' and 'passport'. ...vital reading for anyone contemplating an overland adventure. every biker would do well to read this book even if no trips are planned - because I defy anyone not to have a plan, or the urge to plan, once you reach the back cover. ...a brilliantly informative, yet entertaining read for any motorcyclist with a dash of wanderlust. ... a gritty, honest, hard won review of what actually works and what you really need to ride a motorcycle overland. (AMH6) is just about the most comprehensive travel book I have ever read. ˜Whether you're just dreaming of an adventure, or you've already started planning, you must read this book ... Chris Scott's a veteran of serious travel. 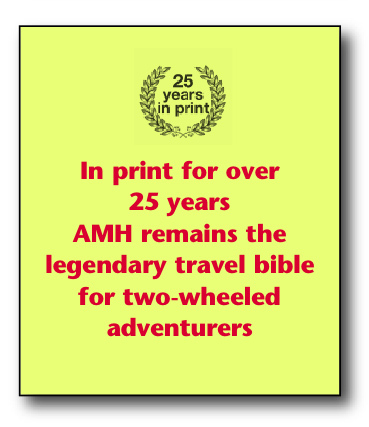 The first edition of the Adventure Motorcycling Handbook ... inspired motorcyclists across the world and launched the motorcycle websites that today bring bikers together to share information and plan their overland adventures. Every red-blooded motorcyclist dreams of making the Big Trip – Chris Scott’s Adventure Motorcycling Handbook, now updated and in its 7th edition, is the comprehensive manual to make that dream a reality. Cape Town to Kathmandu or Patagonia to Mongolia, whether you're planning your own Big Trip or just enjoy reading about other people's adventures, this book is guaranteed to illuminate, entertain and, above all, inspire. Practical information – Choosing a bike and preparation: documentation, sponsorship, ten popular overland machines rated, preparation and gear (what you actually need, not what you can buy) as well as dealing with culture shock, borders, robbery, medical emergencies, shipping, navigation, wild camping, highway and off-road riding, fault diagnosis plus Austin Vince’s filming tips. Trans-continental route outlines – Across Asia, Africa and Latin America – the countries of the developing world: aka the ‘AM Zone’. Tales from the Saddle – Spoke-bending moto adventures from the earliest two-wheel pioneers to recent first-hand accounts. Trip reports from contemporary travellers – including Jamie Duncan, Steph Jeavons, Lois Pryce, Ted Simon and Lisa & Simon Thomas.